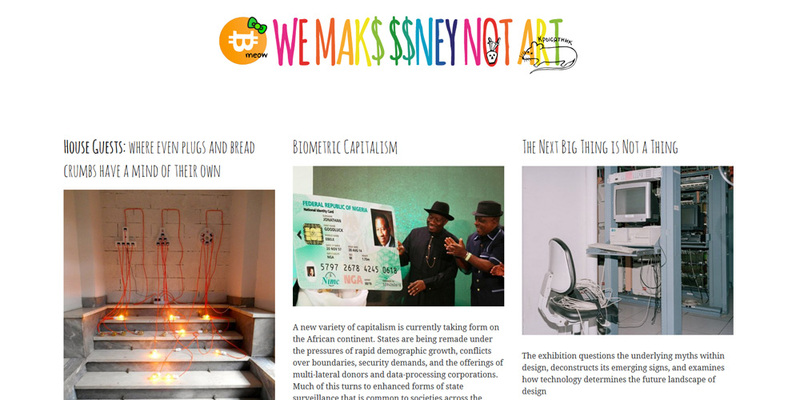 We Make Money Not Art is a blog that focuses on the intersection between art, science, and social issues. Created in March 2004, we-make-money-not-art.com investigates the work of artists, designers, and hackers who are using science and technology in a critical, socially engaged way. The blog is a personal one; it features interviews with artists and scientists, book reviews, reports from media art festivals as well as accidental explorations of contemporary culture at large. to present the many encounters of art and science in an approachable yet rigorous and critical way. to include ‘media art’ in a broader cultural discussion. Régine Debatty (BE) is a writer, curator, critic, and founder of we-make-money-not-art.com. Régine is known for her writings on the intersection between art, science, technology, and social issues. She writes and lectures internationally about the way in which artists, hackers, and designers use technology as a medium for critical discussion. She also created A.I.L. (Artists in Laboratories), a weekly radio program about the connections and collaborations between art and science for the radio station Resonance which broadcasts on 104.4 FM in London (2012–2014), and is the co-author of the book sprint New Art/Science Affinities, published by Carnegie Mellon University.